Christmas holidays are just around the corner. The world is slowing down, my wife’s spinning the 1940s Christmas hits from YouTube, and my neighbor is making a lot of noise with his brand new snowplow. And yes.. Home Alone is on TV again. At CodeTwo we’re going against the tide, as usually. I’m not talking about the secure cloudless Outlook sharing platform we released a few weeks ago – I’m talking about all those coding binges. The folks from the dev department are coding as if the end of the world was close and they could stop it somehow. They can, OK? You’ll see. Fast on the heels of releasing CodeTwo Public Folders 5, we’ve rolled out CodeTwo Email Signatures and immediately made headlines on German IT portals. The product lets users add global, company-wide email signatures to emails sent from Office 365, OWA and Outlook. The application is still young and we’re constantly developing it. In Q1 2013 it’s going to see a major update as we’re adding support for Google Apps signatures, and a host of other improvements. But that’s not all. There are other products in the works at the moment. Some of them are now being tested in the lab, others are still prototypes, and one ground-breaking app is even on my phone now. Let me take a look at it once again. Aaaah I can see a calendar, contacts… OK I was supposed not to tell anyone yet. You can expect to see a number of exciting products – not only for Exchange 2010 and 2013 but also for Office 365 and other platforms. We’re also developing existing applications to make sure they meet all your requirements. And now a sneak peek at our whiteboard. It’s not Battleships! Stay tuned and check back with me later. If you have any questions, feel free to post them here as comments – I’m happy to answer all of them. 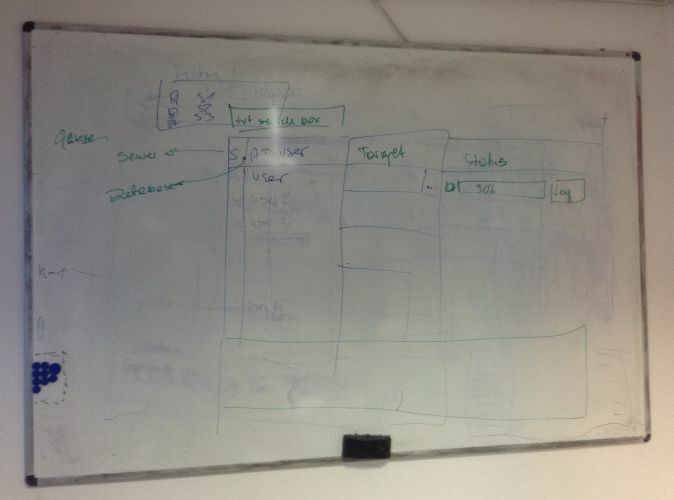 I’m not sure what the mostly empty whiteboard is supposed to tell us? I love that you guys are adding new features. I hope that you’ll spend some time and improve product stability. I’m a long-time customer, but I’m considering looking elsewhere as the current versions CodeTwo’s products are so buggy.